Uljhan is Hindi for "Entanglement" or "In two minds". 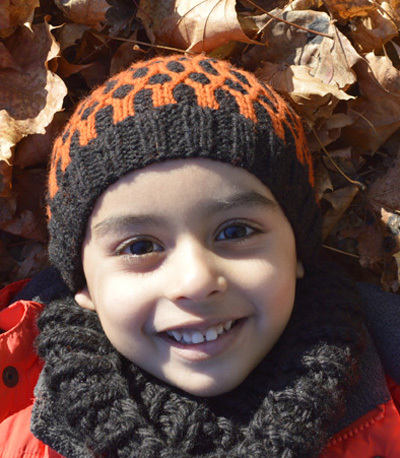 This fun beanie features a play on a 2x2 rib, using two colors of yarn. 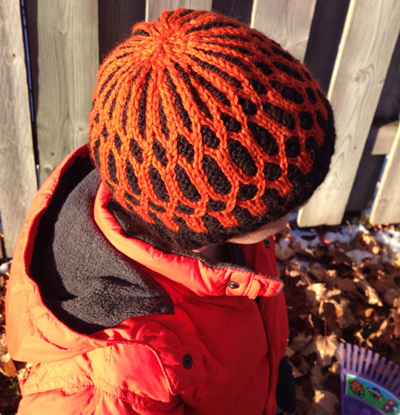 It also uses a 1x1 cable at specified intervals, to form a pretty pattern over the body of the beanie. 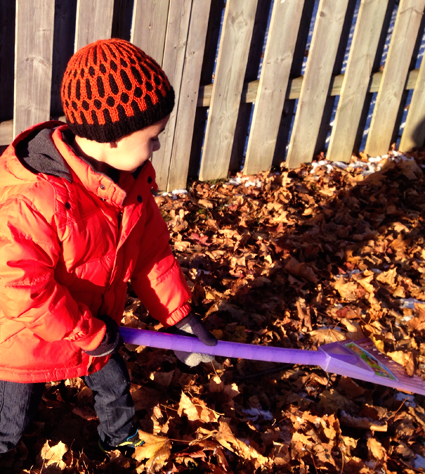 The pattern was born primarily out my necessity of a warm hat for my son. The colorwork makes for a very cozy inner fabric and should keep my son warm and toasty in the extreme winters here in Canada. The choice of the two colors of yarn highlights the stitch pattern, and the ribbing provides a great fit for the wearer. Choose a size closest to or a little smaller than your head circumference. Note: For two smallest sizes, entire hat is to be worked on your favorite small-circumference method: DPNs, two circulars or Magic Loop. For larger sizes, use a 16-inch circular for the body of the hat, and your favorite small-circumference method – DPNs, two circulars or Magic Loop – for the crown decrease. For Preemie size only: Work Rnds 4 to 12 only. For Newborn size only: Work Rnds 2 to 12 only. For Baby size only: Work all rnds. For Toddler size only: Follow Rnds 3 to 12 only. For Child/Teen size only: Work all Rnds. For Adult sizes only: Work Rnds 3 to 12 only. Rnds 1-6: [K1 CC, p2 MC, k1 CC] around. Rnd 7: [LT, RT] around. Rnd 8: [P1 MC, k2 CC, p1 MC] around. Rnd 9: [P1 MC, C2L CC, p1 MC] around. Rnd 10: [P1 MC, k2 CC, p1 MC] around. Rnd 11: [RT, LT] around. C2L: Slip next st to cn and hold in front of work; k1, then k1 from cn. LT: Slip next st to cn and hold in front of work; p1 MC, then k1 CC from cn. RT: Slip next st to cn and hold in back of work; k1 CC, then p1 MC from cn. Using MC, CO 52[60, 72, 76, 88, 96, 108] sts on to smaller needles. PM and join for working in the round. Ribbing rnd: [K2, p2] around. Work Ribbing as set for 1[1, 1.5, 1.5, 1.5, 1.75, 1.75] inches. Inc rnd, Preemie and Child/Teen sizes only: (K6, m1, k7, m1) around. 8 sts increased. Inc rnd, Newborn and Baby sizes only: (K5, m1) around. 12 sts increased. Inc rnd, Toddler size only: [(K5, m1) three times, k4, m1] around. 16 sts. Inc rnd, Small Adult size only: [(K5, m1) four times, k4, m1] around. 20 sts increased. Inc rnd, Large Adult size only: [(K6, m1) twice, (k5, m1) three times] around. 20 sts increased. 60[72, 84, 92, 104, 116, 128] sts. Change to larger needles and join CC. Rnd 1, establish pattern: [K1 CC, k2 MC, k1 CC] around. Next rnd: Starting with Rnd 4[2, 1, 3, 1, 3, 3] of chart, work Body Pattern across rnd. Work in pattern as set, working Rnds 4[2, 1, 3, 1, 3, 3] through 12 only of chart, until hat measures approximately 4[5.5, 5.5, 6.5, 7.75, 8.75] inches from CO, ending after Rnds 1-6 or 12 and ending final Rnd 1 st before the end of rnd. 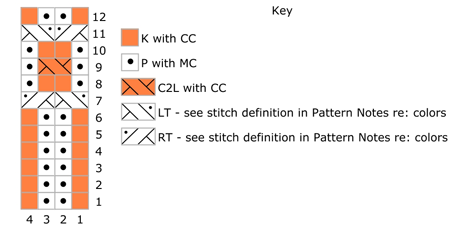 Work in pattern as set until hat measures approximately 4[4.5, 5.5, 6.25, 6.75, 7.75, 8.75] inches from CO, ending with any of pattern Rnd 1-6 or 12, ending final rnd 1 st before the end of the rnd. This is the new start of rnd. Place marker here, removing original marker. Note: As you’re working the decreases, change to needles for working a small circumference, as required. Decrease rnd 1: [K2 CC, p2tog MC] around. 45[54, 63, 69, 78, 87, 96] sts. Decrease rnd 2: [K2tog CC, p1 MC] around. 30[30, 36, 42, 52, 58, 64] sts. Decrease rnd 3: [SSK] around. 15[18, 21, 23, 26, 29, 32] sts. Decrease rnd 4: [K2tog] 7[9, 11, 11, 13, 15, 16] times, k1[0, 0, 1, 0, 0, 0]. 8[9, 11, 12, 13, 15, 16] sts. Cut yarn and pull through final sts to secure. Shweta Shankar Khatri (Designer and Proprietor of DesiLoop) is originally from India and likes to call herself "A Student of Life". She is a self-taught designer who is constantly on the lookout for new techniques, ideas, and inspirations. She has been designing knit and crochet wear for as long as she can remember, but only recently has started publishing them. Her designs have also been featured in newsstand and online magazines like Tangled, & Inside Crochet. She blogs here, and her most recent endeavor is DesiLoop Hand-dyed yarns.